In Laurore v. Miami Automotive Retail, Inc. (3D08-1124), the Third District reversed the trial courts dismissal for fraud on the court. In the trial court, the plaintiff claimed he had never received any payments for disability prior to the incident at issue and claimed lost wages. However, his deposition testimony and interrogatory responses indicated those statements and claims to be false. Based upon the false statements, the trial court dismissed the action for fraud on the court. While we agree that Laurore’s responses to the interrogatories and deposition questions might preclude some of his damage claims, we do not agree that they touch on the issue of liability or all of his damage claims so as to justify dismissal of the entire action with prejudice.1 A trial court’s power to dismiss a case based on fraud should be cautiously and sparingly exercised and then only on "the most blatant showing of fraud, pretense, collusion or other similar wrongdoing." Young v. Curgil, 358 So. 2d 58, 59 (Fla. 3d DCA 1978); see also Tri Star Invs., Inc. v. Miele, 407 So. 2d 292, 293 (Fla. 2d DCA 1981) (same). In this case, the record does not demonstrate that Luarore "sentiently set in motion some unconscionable scheme calculated to interfere with the judicial system’s ability impartially to adjudicate a matter by improperly influencing the trier of fact or unfairly hampering the presentation of the opposing party’s claim or defense" so as to deprive him of a trial on a claim with apparent merit. See Jacob v. Henderson, 840 So. 2d 1167, 1169 (Fla. 2d DCA 2003) (quoting Cox v. Burke, 706 So. 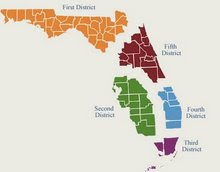 2d 43, 46 (Fla. 5th DCA 1998)).